It looks like Astroprint might be adding the ability to associate printer profiles with printers, so that only “matching printers are offered as a target” (this is a feature I requested). I am seeing this message when print a file: “We couldn’t detected your print file printer profile. This is because it was sliced with a custom printer or with a external slicer. My question: how do I match the device? I cannot find anywhere that I can alter a setting to make this message go away. Thanks for this. The copy is now fixed. Know which printer model the print file was sliced for. If you slice with our slicer, this is done automatically. If you upload a GCODE, you can still tell the system by editing the file in the design library. Your AstroBox needs to specify which printer model is connected to. This is done in the AstroBox’s printer profile settings. This is a feature that we added in the latest release. The printer model has no choice for Anycubic I3, so i cant register it. Maybe a Custom choice could be available ? And i have a saved profile. Also when i click on Filament choice i have an arrow turning and need to switch off AstroTouch. Could you update to the latest software ? We have fixed this. What profiles do you have on your astroprint account? Thanks I’ve updated, and I see the profile UI now. Alas all our printers (Anycubic, 3 models of Tronxy, Wanhao) are not in the list, so I’m no further along (but still happily printing). Ok, last firmware corrected the problem. One more thing… When print start, at the beginning extruder is making a very strange noise. It seem making a retract, why ? Sorry to hijack this question but, I believe I’m having a related issue. When I connect my printer to my AstroBox touch it creates a new profile for my printer in the printer profiles section on my box and in the cloud. I will wind up with like 12 of the same printers. 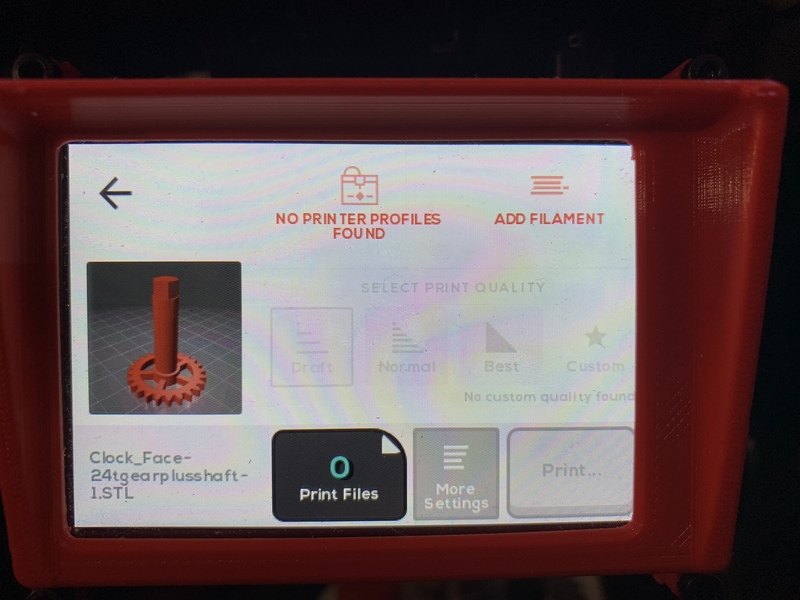 The issue is that I have custom slicer profiles associated with my primary profile that I have on my Astro Print Cloud and I have also installed a extended bed that is bigger than the default platform in the imported profile. Is there any way to make my Astro Box lock out automatically making a new profile and only load my custom profiles and settings? This is an old problem. What software are you running on the astrobox? I did an update just this last time that I used it a week or so ago, so it should be the newest or newish. The astrobox touch is at the library that I donated the printer setup to or I would double check for sure and give you the specific version number. This last update added the functionality for z baby stepping if that is any help? Sorry for the late reply. My astrobox-touch has version v0.16(2). When I try to update it says I’m on the latest release when I try to update. Ok, Please delete all the profiles that it created and now that we know you’re using the latest, let’s watch it. This was a problem which was fixed. I’ll keep you apprised . I have a free print event happening a the library this weekend. That will be my next opportunity to see how it functions.